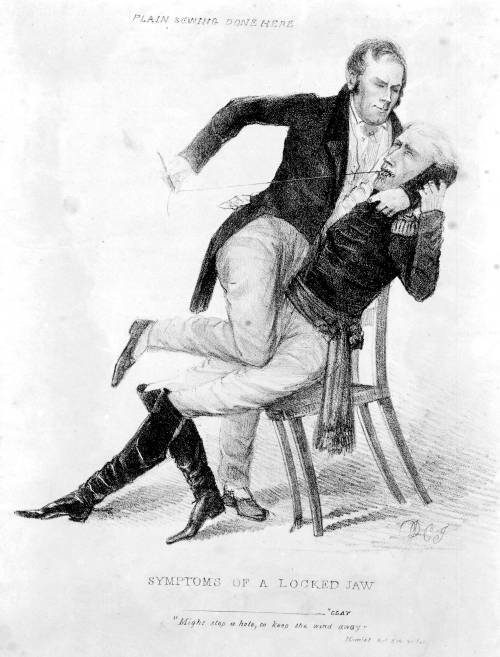 The caricature reflects the bitter antagonism between Kentucky senator Henry Clay and President Andrew Jackson, during the protracted battle over the future of the Bank of the United States from 1832 through 1836. The print may relate specifically to Clay's successful 1834 campaign to exclude from the Senate journal Jackson's statement of protest against Congressional censure of his earlier actions on the Bank. Clay is shown restraining a seated, uniformed Jackson and sewing up his mouth. From Clay's pocket protrudes a slip of paper reading, "cure for calumny." Below the image is a quote from Shakespeare's "Hamlet," ". . . Clay might stop a hole, to keep the wind away." On the wall behind him are the words "Plain sewing done here."